Nobody I know of has taken "two full days". I recommend a weekend so you can take your time. These batteries have the same goo inside. How long is your idea of a weekend? Do you include Friday for three days??? It's about 4 hours of labour for the first time, and lots of people have validated that. But it's much easier to do it in 3 chunks. And yes my weekend I count from Friday night to Sunday night. For a person like myself, who triple-checks each step before proceeding, it could take a week. 2k1Toaster and kenoarto like this. I just finish my install today and, firstly I want to thank Toaster for creating this kit and standing by it. This has been a lifesaver for me. The dealer wanted $3200, when my battery kicked the bucket, and as a full time Lyft/Uber driver I was hemorrhaging money every day I was without a car, but I wasn’t willing to pay that much for a 9 year old vehicle with 173,000 miles on it. After I found newpriusbatteries.com via a desperate web search I came here to see if anybody had tried the product and found this thread. After reading all 30 something pages I was convinced this Toaster guy is an absolute genius. Has he batted down every challenge the skeptics have tried to throw at him. It’s pretty awesome, actually. I ordered the battery around 8 o’clock on a Thursday night and it arrived here in north Florida 8 days later. (This was the week of the polar vortex that was causing negative 30 degree temps up north which surely didn’t help shipping times.) 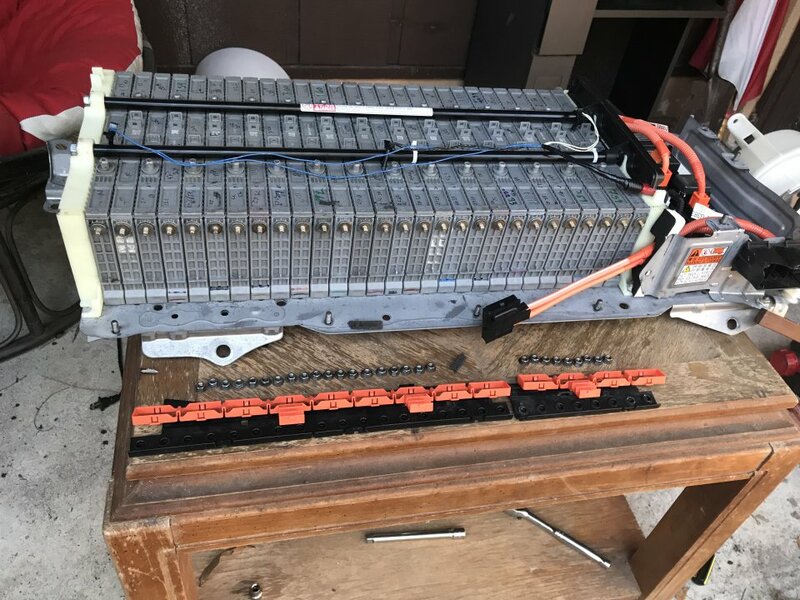 While I was waiting for the shipment I took the old battery out of my car, broke it down and threw a tarp over it until the new cells arrived. Detaching the battery was not difficult, but it was helpful to have a friend help lift it out of the car. I didn’t remove the side panel in the car or the fan vent, and I was able to get the battery out anyway with a long extension on my socket wrench. My battery kit arrived after dark but I was eager to get back to work and I was driving my woman nuts with my cabin fever by that point so I put on a headlamp and got to work. Yes, I did this install in the dark with no problems. 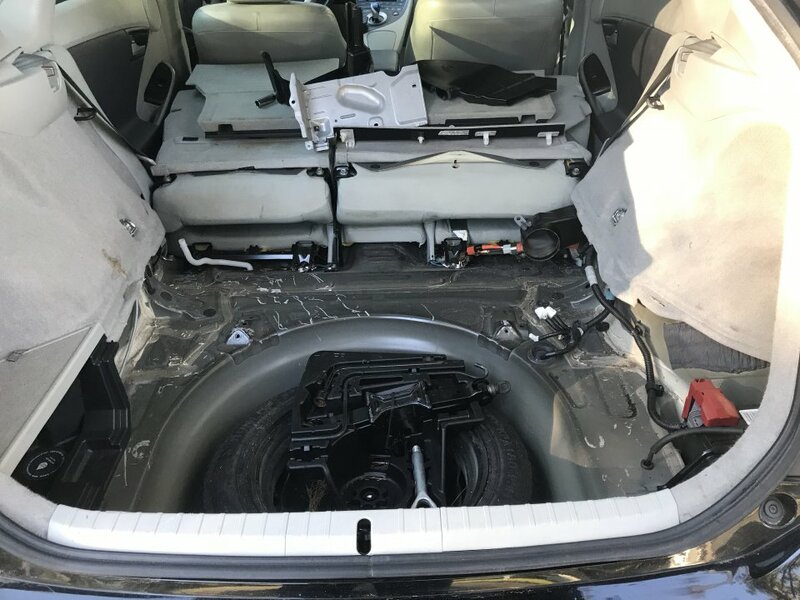 Even while being very careful, it only took me about 3 hours to put it all together and install it back inside the car, and like some other users I actually really enjoyed it. It was sort of like following LEGO directions! I feel like I have a much deeper understanding of what’s going on under the backseat of my car now. After everything was finished I cleared all the DTC codes and fired her up. She went into ready mode, ICE kicked in for a few minutes, then shut off. I cautiously pulled out and drove down the road. No problems. Nothing alarming. Car is working! It felt great. I went downtown, did some ubering, made $80, and came back home. Feels good man. That night I drove about 60 miles. Gas mileage was at 43 mpg. Lots of stop and go and a bit of sitting and waiting on people. No issues.  I’ll definilty post updates. Anyone who is having doubts about the kit. Do it. It just flat out works. I probably feel more confident in this kit right now than I do about the Toyota dealer. TomB985, 2k1Toaster, Mendel Leisk and 2 others like this. Perhaps one of our experts @ericbecky can chime in. He used one for several thousand miles before he chose to trade in his car. Refurbished cells are just a fancy name for USED. 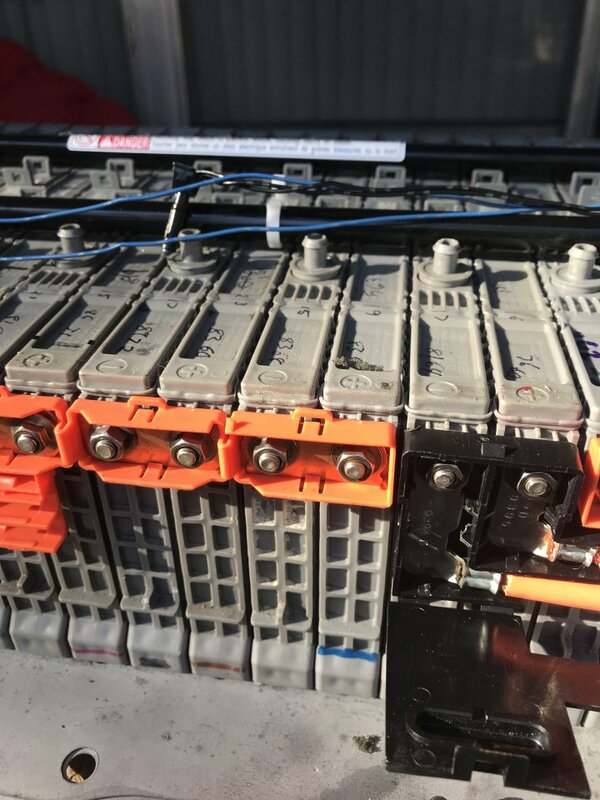 Give the decreased cot for NEW batteries, going for USED batteries doesn't often make much sense anymore. I installed these cylindrical cells in a car, ran it for a few months as a test. They worked fine. Much better than the aftermarket stock-looking prismatic modules. If not choosing NEW cells directly from Toyota, these NEW cylindrical modules are a good choice assuming you are doing the labor yourself. Makes a difference if you have to pay someone else for the labor and you expect them to be take the risk/warranty on assembling it. And for everyone doing this job yourself, please take a moment to buy or rent an inch-pound torque wrench so you can PROPERLY TIGHTEN all the connections. Seriously, don't be so cheap and lazy that you just guess how tight the connections are. That is a just asking for trouble. TomB985, Robert Holt, kenoarto and 5 others like this. I just got done doing some trips around town, and I decided to see how high I could get the gas mileage by driving like a granny. 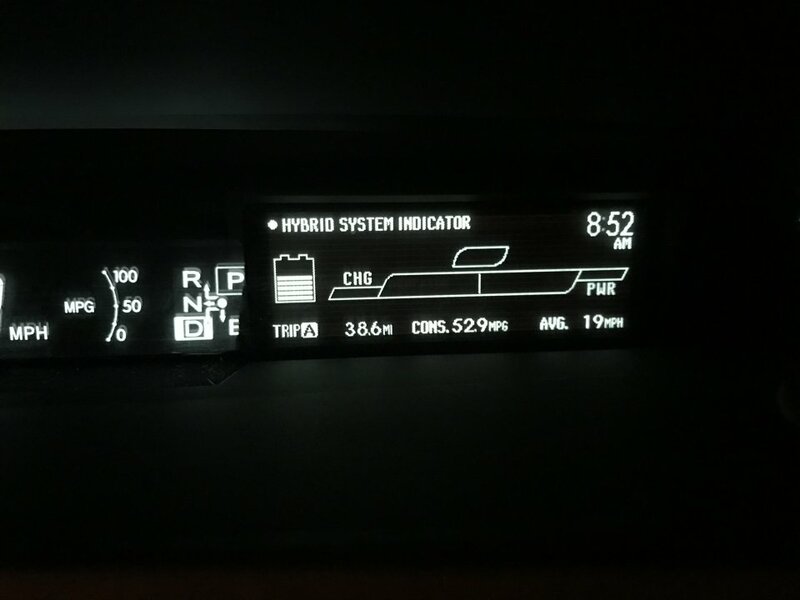 38 1/2 miles at 53 Mpg! The battery holds a charge really well. I don’t think it got down to two bars one time during this trip. With my old battery I would get the mileage up pretty good and then I would stop at a stop light and the ICE would have to kick on and it would knock the mileage back down. Apparently, those days are over. TomB985, KevininFl, Robert Holt and 3 others like this. I replaced my traction battery over the Thanksgiving holiday and everything appears fine. 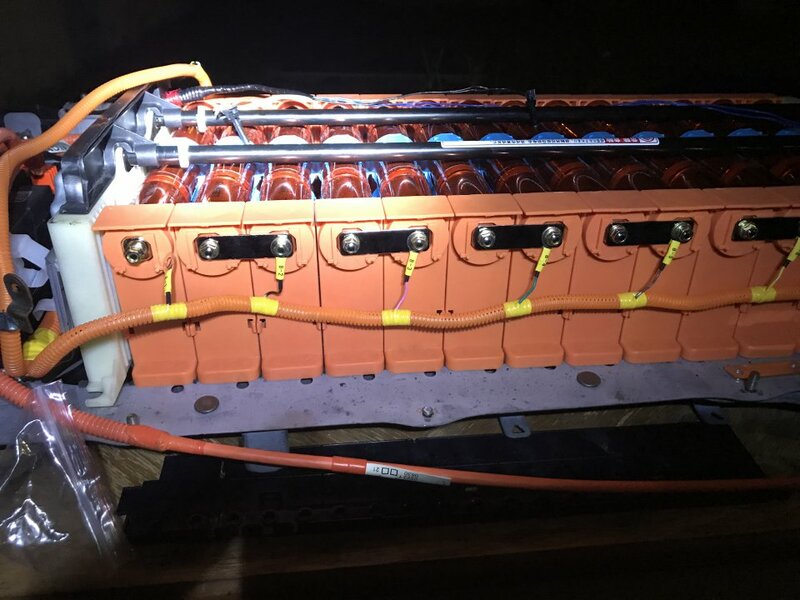 I'm not really a car guy or into battery tech, so all I can confirm is that my car drives great, there are no warning lights, and I have no reason to think there will be a problem. It took me 2 days to install it, but that was me being very cautious and only working a couple of hours each day. I think 2-4 hours straight is a good estimate. About half of the time is removing and reinstalling the battery in the car. The module and harness swap is the other half of the time. 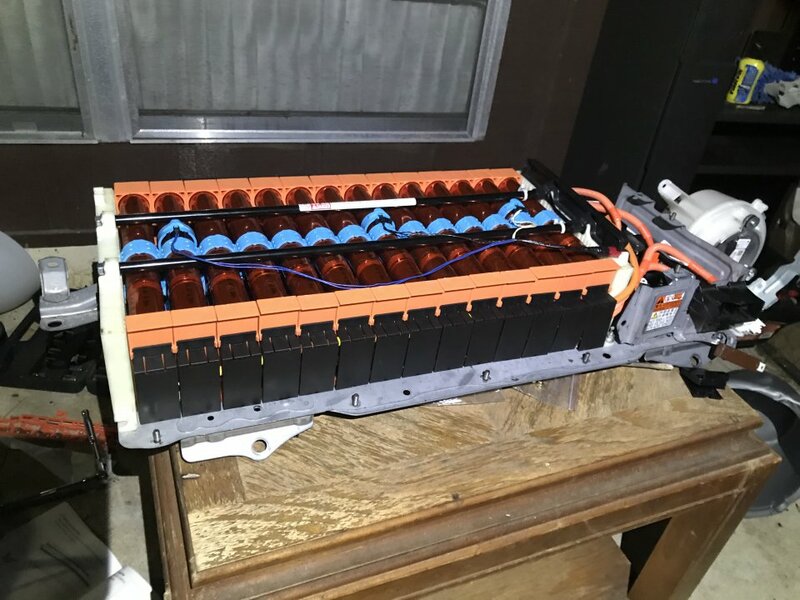 I did the job by myself, so I can confirm that it's a pain in the $%^& to remove the 70 lb battery from the car without scratching anything. I had a few questions and the customer service was great. My questions were basically because I was over thinking it. One question for the forum, does anyone know if I can sell the old modules without load testing? I was thinking about putting all of them on craigslist "as is". I could get the equipment and learn how to load test, but I'm really not a car/battery guy and I don't think I'll need to do this again. Raytheeagle and 2k1Toaster like this. Somebody here like @TMR-JWAP might buy them. He works with them as a hobby. I think someone would buy them. Just don’t expect a top price. You can sell things however you want. Although you may want to keep them around since you will need them if/when you ever want to get a Toyota pack. Without them your battery will be rejected as a core. (So tack on an additional $1,350 to battery price.) But hopefully by the time you need one you can buy a different core for less, or maybe buy someone else's junk cells and reinstall them so you can get credit for the core. As it is now, you can find junk modules on eBay (listed as such) for about $5 which would be good to rebuild a core if ever needed. Does Toyota look for consecutive serial nos? Or is that just crazy talk? So far I have not had any non-consecutive cores getting kicked back. Good to know that junk modules can be had for so cheap. that makes obtaining a core much more palatable. I think there was actually one guy that posted here on PC that they wouldn't take his core back until he argued. Serialization was one of the reasons... Pretty recently, like in the past few months? But that was the first and only I've heard of that. Maybe just hang onto old modules, simpler. Without them your battery will be rejected as a core. (So tack on an additional $1,350 to battery price.). Thanks for putting a price on it. I have asked my Toyota dealer(*) for a quote (1553euro, 1760$ at todays rate, our prices always include VAT/TAX).for a full pack. And they have confirmed this is without any need for sending the old pack back. I still don't trust this... even less after seeing your 1350$ remark. (*) subsidiary of the Dutch importer, so they *should* know what they are on about and have short links to the importer. $1,760 and not having to send in a core is a great deal. My car is running great. Im averaging 48 mpg driving normally on regular (not eco) mode. I feel pretty confident that the new battery kit will outlast my car, and I won’t ever need to deal with Toyota. 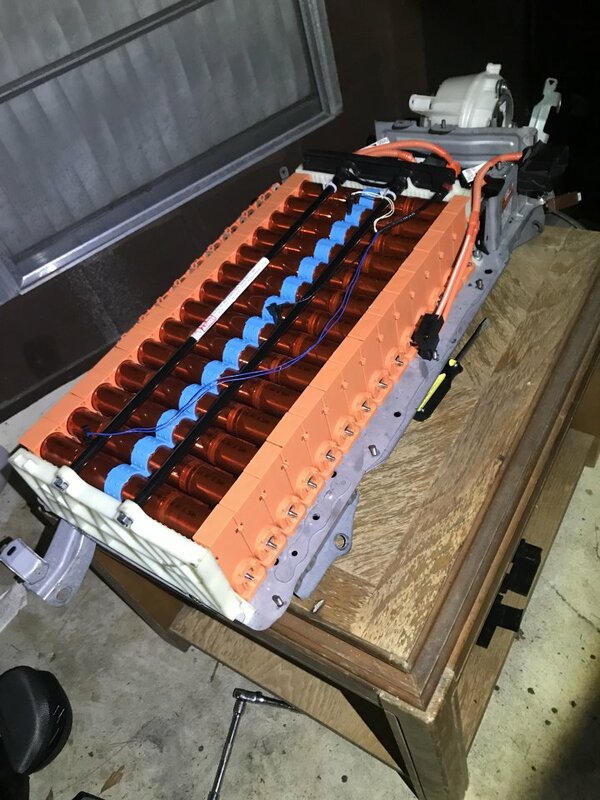 I drive around 30,000 miles a year, and my car is currently 10 years old with 175,000 miles, so the new battery only needs to go another 5 or 6 years. I feel pretty confident that it will do at least that. royrose, Skibob and Prodigyplace like this. I’ve gone about 1000 miles with the new battery now. 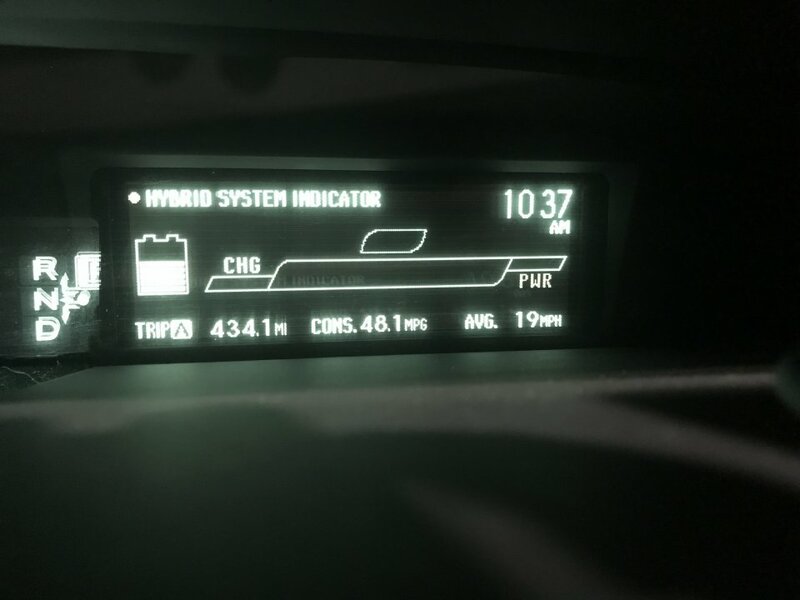 Got 48.1 MPG on my last tank without using eco mode. Filled up before the gas gauge started blinking, so I could have gone quite bit further. No issues to report. Prodigyplace, Mendel Leisk, 2k1Toaster and 1 other person like this.